Last night some of the Original-jugend started working on something they never seen before. Take a close look at the manifolds and you see that these guys are way off base trying to figure out modern VW technology. Having only exsperienced changing oil on a 25 hp engine before, the 1600 DP engine seemed to scare them a little bit. 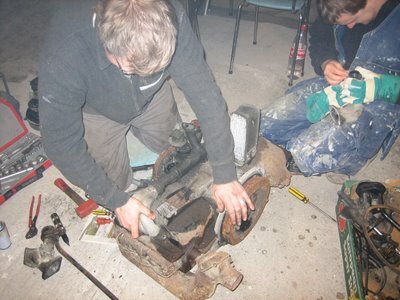 But after stripping down the tinware, and fitting the engine with 25 hp fanhousing and generator, the boys looked more relaxed. More pictures to come of this "wolf in sheep-clothing" engine build.